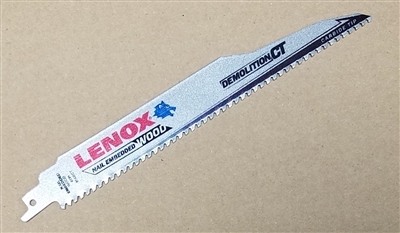 This carbide tipped demolition blade from Lenox cuts nail embedded wood & lasts up to 10X longer than standard bi-metal reciprocating blades. High performance carbides are welded to increase durability and prevent tooth loss. Durable construction provides shatter resistance. Killer demo blade - This carbide tipped blade cuts nail embedded wood and has up to 10X longer life than standard bi-metal reciprocating blades (vs. 6 TPI standard LENOX bi-metal reciprocating saw blades cutting wood with nails).